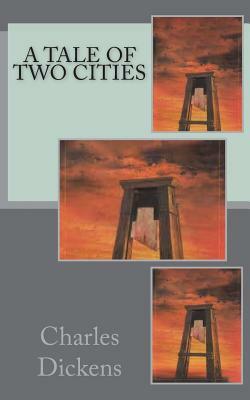 A Tale of Two Cities Paperback by Charles Dickens A Tale of Two Cities (1859) is a novel by Charles Dickens, set in London and Paris before and during the French Revolution. With well over 200 million copies sold, it ranks amongst the most famous works in the history of literary fiction. The novel depicts the plight of the French peasantry demoralised by the French aristocracy in the years leading up to the revolution, the corresponding brutality demonstrated by the revolutionaries toward the former aristocrats in the early years of the revolution, and many unflattering social parallels with life in London during the same time period. It follows the lives of several characters through these events. The 45-chapter novel was published in 31 weekly instalments in Dickens's new literary periodical titled All the Year Round. From April 1859 to November 1859, Dickens also republished the chapters as eight monthly sections in green covers. All but three of Dickens's previous novels had appeared only as monthly instalments. The first weekly instalment of A Tale of Two Cities ran in the first issue of All the Year Round on 30 April 1859. The last ran thirty weeks later, on 26 November. We are delighted to publish this classic book as part of our extensive Classic Library collection. Many of the books in our collection have been out of print for decades, and therefore have not been accessible to the general public. The aim of our publishing program is to facilitate rapid access to this vast reservoir of literature, and our view is that this is a significant literary work, which deserves to be brought back into print after many decades. The contents of the vast majority of titles in the Classic Library have been scanned from the original works. To ensure a high quality product, each title has been meticulously hand curated by our staff. Our philosophy has been guided by a desire to provide the reader with a book that is as close as possible to ownership of the original work. We hope that you will enjoy this wonderful classic work, and that for you it becomes an enriching experience.